Butterfinger from Nestle is a brand predominantly known abroad for its peanut butter products. I should know, in the past I have spent quite a few pennies on the imported bars as I am such a peanut butter fan. 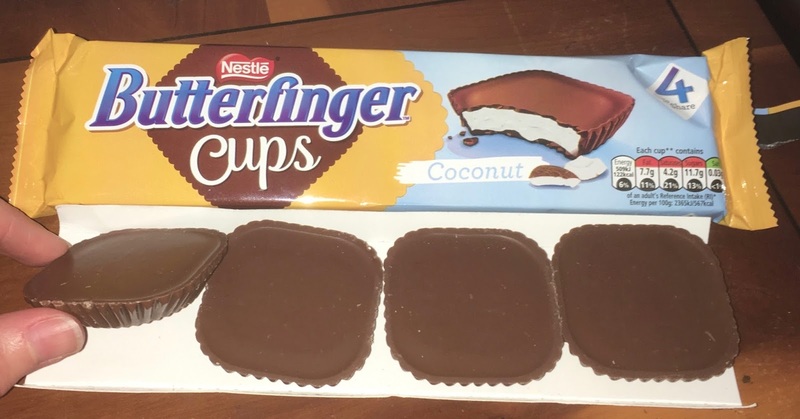 Peanut butter Butterfinger Cups have finally launched in the UK, and I recently wrote about them. The other new launch in the range was these Butterfinger Cups Coconut edition, with no peanut butter involved. Well, I still couldn’t resist them. As with the peanut butter ones there are four cups in the packet, sitting on a cardboard tray. If Butterfinger Cups are new to you I should point out that they aren’t cups at all really, more shallow squares of chocolate with a filling. I gave one a try and found that there was plenty of chocolate, and good hearty filling of coconut. The filling was firm, but by no means solid, and it had that lovely texture of coconut that I like the feel off, where you can pick up on the crispy bits within it. 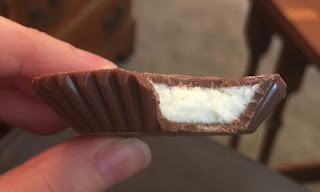 The filling was creamy and sweet and very rich in coconut, and the milk chocolate brought balance to this and turned it into a rather lovely treat. There are four to share and they are nice to give out instead of biscuits with a cup of coffee. As much as I loved these, the peanut butter ones are still my favourites, but that just personal choice, both are yummy. Have you tried them, which did you prefer? I've heard there is another variety currently available at Asda: Hazelnut. Alas that's too woody a flavour for me. Coconut is nice but it's no Cabana! I am going to have to get myself some of the hazelnut ones to try!